So I thought it might be a good idea to write a small series on essential oils for those who are seeking knowledge. Since I was first introduced to essential oils a couple of years ago, they’ve become a big part of my life. I use essential oils almost daily. I diffuse them in my house using a diffuser, I have essential oil jewelry that I wear often, I have made various room sprays, I use essential oils for cleaning and I will often put a drop or two on my pillow at night, to name a few ways that I use essential oils. I’ll be going over all of the above in upcoming blog posts, but today I’m going to answer the question of what an essential oil diffuser is, the differences between various diffusers and how to choose the right diffuser for you. There are various ways to harness the benefits of essential oils, but diffusing is arguably the most popular. In a nutshell, when you’re diffusing essential oils, what that means is you’re releasing the essential oils into the air and inhaling them. Diffusing essential oils into your home environment is an excellent way to take advantage of the therapeutic benefits of essential oils, not to mention the various other benefits that diffusing essential oils provides. There are various types of essential oil diffusers, including ultrasonic diffusers, nebulizing diffusers and heat diffusers. The first essential oil diffuser I ever owned was an ultrasonic diffuser, and it’s partially responsible for getting me hooked on essential oils. It’s also the diffuser I use whenever my son has a cough or congestion. Ultrasonic diffusers work by releasing a cool mist of water and essential oils into the air. They are particularly beneficial for use in winter and when you’re suffering from congestion, because they also double as a humidifier. Because ultrasonic diffusers release a mixture of essential oils and water into the environment, the mist is not as concentrated as a nebulizing diffuser. This is not necessarily a negative, though. Some people prefer to have a less concentrated mist released from their diffuser. Nebulizing essential oil diffusers work by atomizing or reducing the essential oils into a fine spray and releasing them into the environment. Unlike an ultrasonic diffuser, there is no water required. Because there is nothing added to a nebulizing diffuser besides your essential oils, the chemical composition of the oils are not changed, and the concentration is much higher. Again, just like some people prefer ultrasonic diffusers because the mist is less concentrated, others prefer nebulizing diffusers because the mist is MORE concentrated. It really comes down to personal choice. Heat diffusers are the cheapest type of diffuser you can buy, and they’re thought to be the least effective. Essential oils are volatile in nature, and heat alters the chemical composition of the oils. By using a heat diffuser to disperse your essential oils, you will often be losing many of the therapeutic properties of the oils and be left with just the scent. Of course, the scents of various essential oils are known to have therapeutic properties in and of themselves, so this is still beneficial. For example, the scent of lavender can aid in relaxation. However, I would recommend trying to purchase an ultrasonic or nebulizing diffuser over a heat diffuser, if your budget allows it. 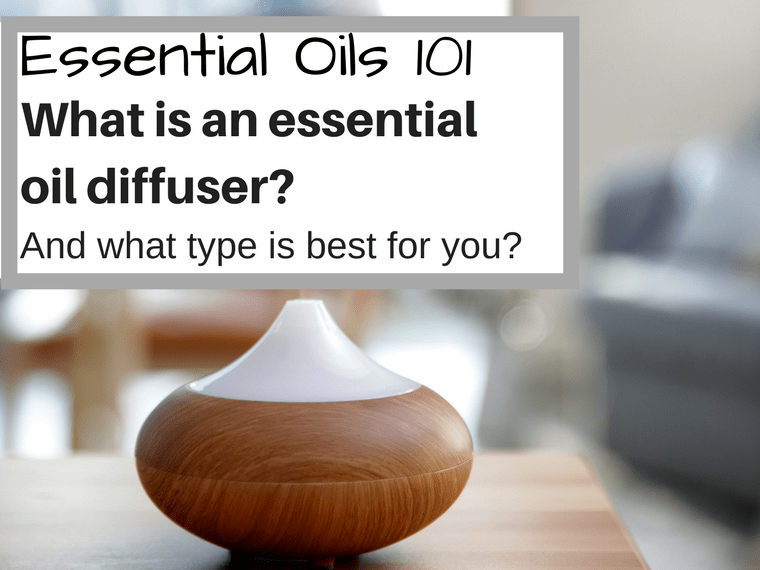 Hopefully this has helped to answer the question of what is an essential oil diffuser! As you can see, there are various types of diffusers available, and a lot of it comes down to personal preference. My personal favorite type of diffusers is an ultrasonic diffuser, followed by a nebulizing diffuser. For everyday use, I definitely prefer an ultrasonic diffuser. Stay tuned for upcoming posts in my essential oils series!